Here’s a first step that’s important to consider - finishing. Often times, a creative fold can set your piece apart. At James Printing, from routine to specialty folds, we can help you create a piece that will make an impact. So many times, other printers will have the folding and gluing part of the job outsourced. This means that they may lose some control over the final product. It’s the extra little steps we take that make all the difference. 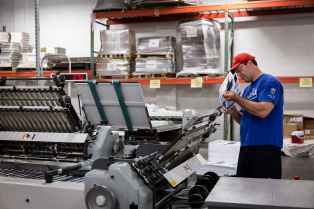 Whether your next project requires parallel, right angle, gate or accordion folding sequences, we have the high-speed automated folding machines to meet all of your folding needs. We routinely apply inline folder scores that reduce unsightly cracking problems without incurring the additional cost of offline letterpress scoring. Plus, converting products with unusual shapes and sizes is a James Printing specialty. We then provide the right gluing solution to make even the most intricate shapes and folds come to life. Whether you need permanent, EZ-release or one that can be remoistened, we’ve got you covered. We’ve even done projects that were a combination of all of these. Large or small, we can fold or glue it all. Our large and mini format folders allow us to fold, score and perforate your projects saving you time and hassle. Our top of the line folders can manage pages ranging between 3/4” and 40". No project is too complex or unusual. In over 30 years, we’ve done just about anything your imagination can conjure up. 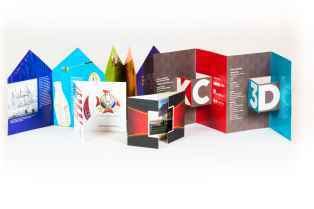 Contact Us for help with your folding or gluing projects. You’ll find our consulting helpful and our prices competitive.